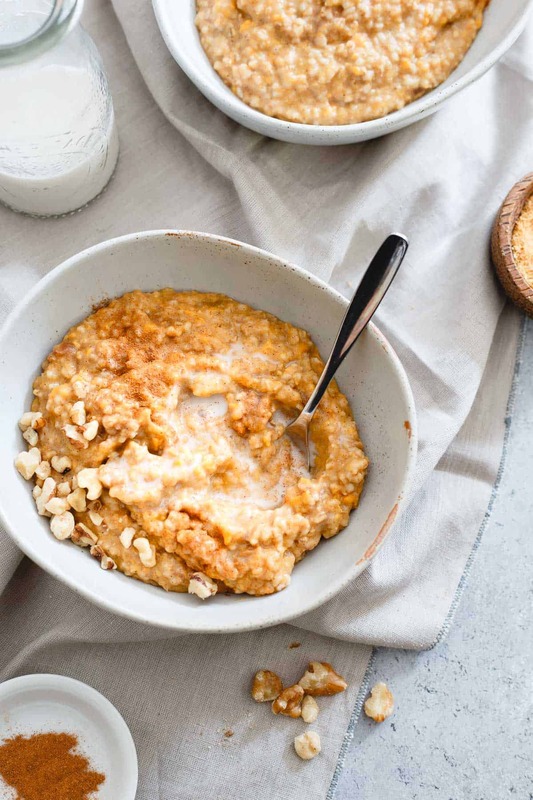 These cozy instant pot sweet potato steel cut oats are filled with golden raisins and warming winter spices. Set it the night before and wake up to a bowl! It had been some time since my last cozy bowl of steel cut oats for breakfast. I normally workout in the afternoon/evening and therefore try to keep my carbs lower in the morning but this time of year, waking up to a cold house, sometimes nothing sounds better than a warm bowl of oatmeal. I bought an Instant Pot (<–that’s the model I have) earlier this year after borrowing Brandy’s for a few days to test it out. I’ll be honest, I really didn’t want to love it. She basically had to force the thing on me to try it out because I just flat out refused to buy another countertop appliance (I hate counter clutter in a major way). It didn’t take me long to fall in love though. The first thing I made was an entire chicken in the thing and when it only took 20 some minutes for it to be cooked and basically fell apart on my cutting board (I hate carving whole birds almost just as much as countertop clutter), I was sold. A few soups, stews, a roast, a dozen hardboiled eggs later, she pretty much had to pry my hands off of it to get the thing back. With the option to slow cook and saute in the Instant Pot as well as pressure cook, it just makes much more sense as my main countertop appliance than a slow cooker (which has been moved to the basement shelves only to be used every now and then). 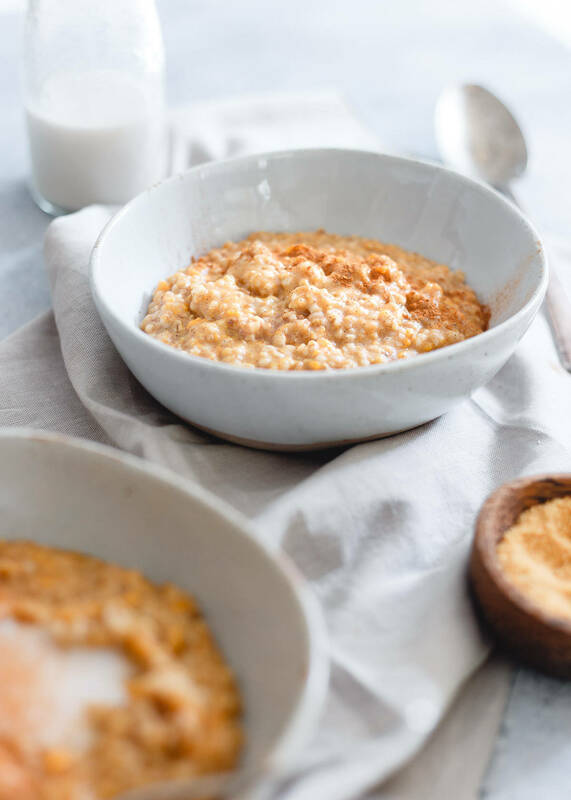 So, I bought my own and have been happily easing my way into pressure cooking these last few months but have yet to share a pressure cooking recipe with you until today with these Instant Pot sweet potato steel cut oats. I adore steel cut oats (these steel cut oats with orange blackberry sauce are still an old-time favorite – that desperately need a photo makeover but trust me, they’re delicious and soooo creamy). They just have the best chewy texture that you don’t really get with regular oatmeal and I find them to be a bit more filling. I knew this was a great opportunity for the Instant Pot. It would get the sweet potato tender enough to mash right into the oats without having to precook it and it would do it in literally just minutes. Pressure cooking is kinda like airplanes flying to me. I’m just straight up baffled and amazed by how both work. The result is a creamy, slightly chewy bowl of comfort. 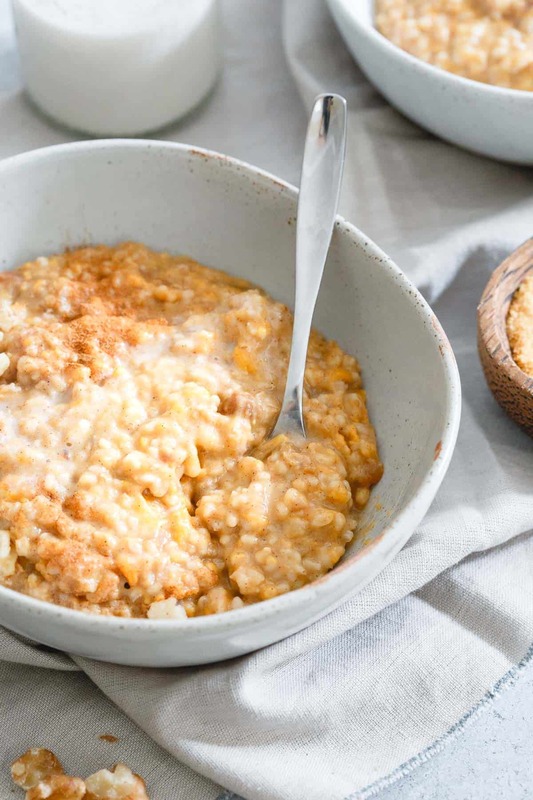 These Instant Pot sweet potato steel cut oats have just a touch of sweetness thanks to those golden raisins (that plump up so perfectly while cooking), warming flavor from the spices, they’re hearty, filling and begging for a touch of milk/cream on top and a drizzle of maple syrup on a cold fall or winter morning. 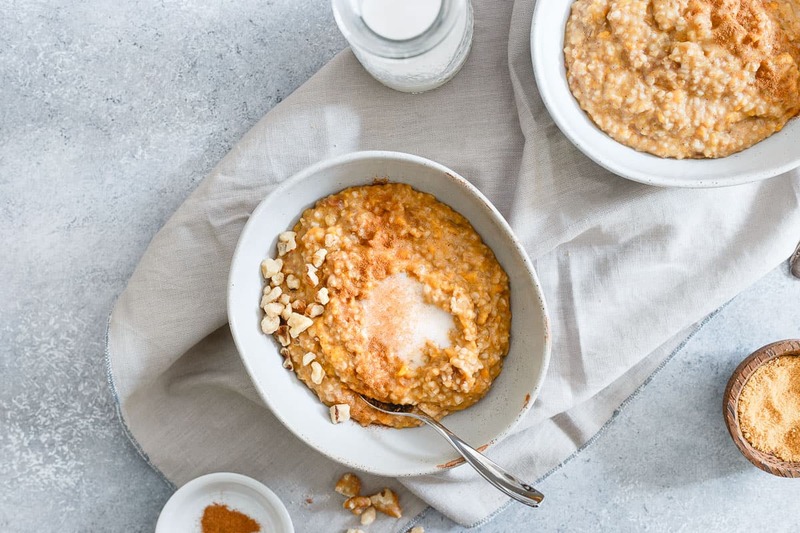 Love this Instant Pot Sweet Potato Steel Cut Oats recipe? More oatmeal recipes for fall/winter: slow cooker apple butter carrot cake oatmeal, triple chocolate steel cut oatmeal, slow cooker chocolate cherry steel cut oatmeal. Place oats, sweet potato, raisins, water and spices in the Instant Pot. Close the lid, make sure lever is set to "sealing". Select manual, set cook time to 15 minutes and allow the Instant Pot to fully natural release. Once released (and pin has dropped all the way down), carefully remove lid, give the oats a stir. You can either leave the sweet potato in small chunks or use a potato masher to blend them into the oats (which is what I did in the pictures above). *There's no added sugar in this recipe. The only sweetness comes from the golden raisins. If you prefer your oatmeal sweeter, add some maple syrup on top before serving. **Cook time does not include time for natural release. Mine took about 10 minutes. If you want to set this up the night before, add all ingredients to the IP and use the delay start option. Set it to have the IP begin cooking about 30 minutes before you want to eat. Instant pot inspiration! Must try. I forgot how much I love creamy steel cut oats. How do you cook the oats and potato without any liquid? Won’t that scorch the pot? ?? There’s 1 1/3 cup water in the recipe. To the author of this post, you need to add a comment about the water in your instructions. Right now it’s saying to just add dry ingredients to the pot (oats, sweet potatoes, raisins). Thanks so much for pointing that out, it’s been fixed. This turned out really nicely. I didn’t add additional sweetness as I like my oats not too sweet. I did plop a couple teaspoons of full fat yoghurt on top with some chia seeds and it was tasty and bumped up the fibre. Just one note – it should be mL for water/liquids, not milligrams (mg) . thanks and I’ll be back to try more. Glad you liked it! I do yogurt on top of my oats often too for some extra protein, great idea. And thanks for noting the unit mistake, that’s been edited.